The number of hospitals and ambulatory surgery centers in the United States is at parity today with 5,532 surgery centers and 5,534 hospitals. 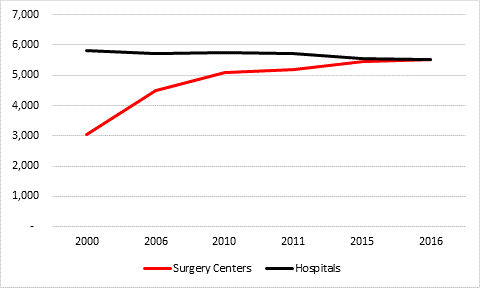 Surgery centers have grown 82% since 2000 – nearly double – while hospitals have declined 5%. Today, two-thirds of surgeries are performed on an outpatient basis, an increase of 30% since 1990. The proliferation of outpatient surgery is due to medical and technological advances, including improvements in anesthesia, that expand the type of cases that can be handled in an outpatient setting. Outpatient locations offer greater convenience to patients and physicians, including improved scheduling with no disruption from unscheduled or emergency surgeries as in hospitals. The lower cost of surgery centers results in a significant reduction in charges. On average, outpatient surgery charges are 57% of comparable hospital reimbursement rates. 61% of ASCs are single specialty. Gastroenterology, ophthalmology and pain management are the leading specialties, offering endoscopy and colonoscopy, cataract and vision correction surgery, and pain management procedures, respectively. 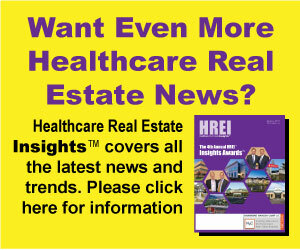 Surgery center ownership is highly fragmented. The top 6 operators of ASCs manage 20% of all surgery centers. The vast majority of ASCs are owned in part or in full by physicians. 64% of surgery centers are completely owned by physicians. 29% of surgery centers are joint ventures between physicians, operators and/or hospitals. Only 7% of ASCs are 100%-owned by hospitals or a corporate provider. The average surgery center has 15,447 square feet and houses 3 operating rooms.